The canine and her handler, Denise Corliss passed a flank of rescue workers and firemen at the Cy-Fair Volunteer Fire Department prior to entering the Fairfield Animal Hospital for her final good-bye. 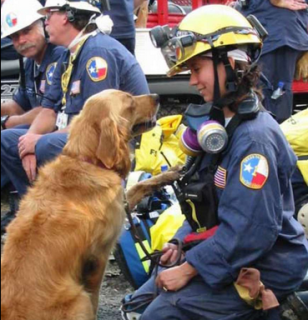 The shaggy golden retriever was a beloved fixture at firehouses and special events in the Cypress area, as well as an important symbol to the country’s search-and-rescue community. Some may say the most a dog could ever achieve in a lifetime is just being be a pet. However, to the over 400 members of the Cy-Fair Volunteer Fire Department, Bretagne was so much more. She was a civil servant, a hero and family. ”We will remember her fondly, and continue serving the community with her as inspiration,” said a representative of the fire department. 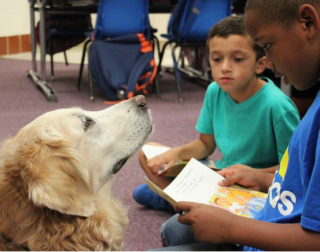 She was nominated for a Hero Dog Award from the American Humane Association in 2014. An online biography posted by the organization says that Bretagne served as an ambassador for search and rescue dogs in retirement. As the number of surviving Sept. 11 search dogs dwindled, Bretagne's public profile grew. She visited the Sept. 11 memorial at the age of 15. Last year, she celebrated her 16th birthday with another trip to New York, to be lavished with presents, food and affection. In recent years, Bretagne had slowed down considerably because of her age, but was still a beloved fixture at the firehouse. Starting at age 13, Bretagne started to experience so much stiffness and joint pain that she could no longer climb the stairs in her home. Corliss installed an above-ground pool in her backyard and helped Bretagne to swim in it for at least 10 minutes a day. When it appeared that the pain would have been too much to live with, Corliss decided on euthanasia. Amy Ramon, fire chief of the Cy-Fair Volunteer Fire Department, said Bretagne "touched every station" in the agency. "She's a part of the Cy-Fair family," a tearful Ramon said before Bretagne took her final walk. 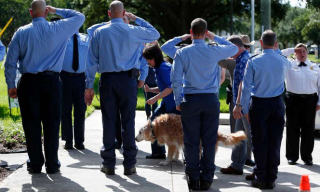 He was among the two-dozen firefighters and members of the search-and-rescue community who lined the sidewalk at the Fairfield Animal Hospital in Cypress and saluted the dog and her service one last time. She then crossed the threshold of the vet's office. Through the window, she looked back outside toward the gathering of firefighters and friends, with a friendly look that seemed like a smile.